Wedding invitation is one of the precious part of all wedding preparations. We provide wedding card designer software that helps you to design and print customized wedding cards for your dream day. Wedding card designing program is developed with different predefined templates to create colorful wedding cards to invite your friends, relatives and other people on this special occasion. Make your own wedding invitation card with wedding card maker program. You can make colorful wedding invitation cards in different shapes and sizes. 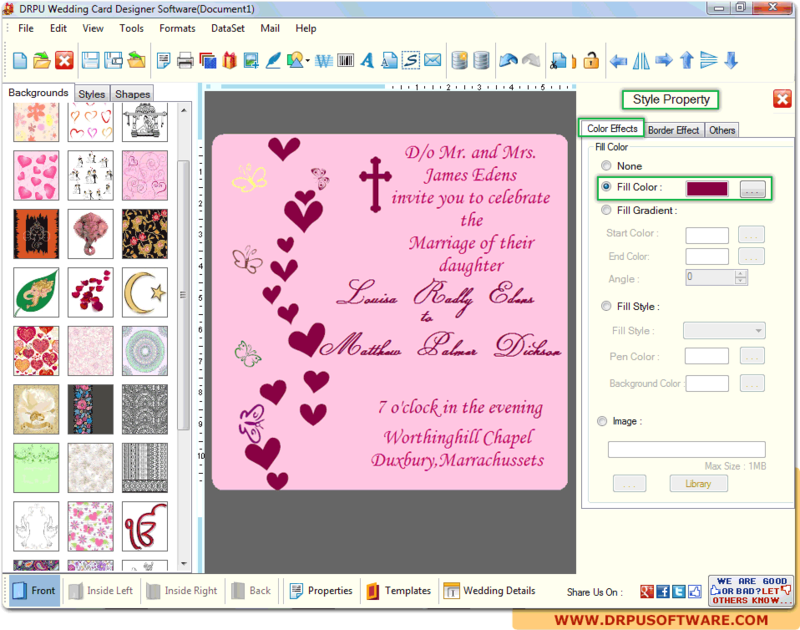 Wedding card creator software provides facility to design bulk numbers of wedding cards using data set series feature. Design Wedding Cards with the help of different image designing Tools including Text, Clip Art, Signature, Word Art, Barcode, Shape Type and Insert Image. Create Wedding cards in various shapes including rectangle, ellipse, rounded rectangle and CD/DVD shapes. Provide facility to add Backgrounds, Styles, Shapes and Wedding Templates on the card. Enable you to create multiple numbers of wedding invitation card for different people. Allow you to insert image from library during wedding card designing process. Empower you to print designed wedding cards using printing settings. Provides inbuilt email settings to send designed wedding card at specified email address.